Visiting the Oak Alley Plantation is an important reminder of the past and how people must remember history so that it does not repeat. This scenic, beautiful and historic setting features a tour, a restaurant, a gift shop and cottages for overnight stays as guests should plan on spending a full day there. 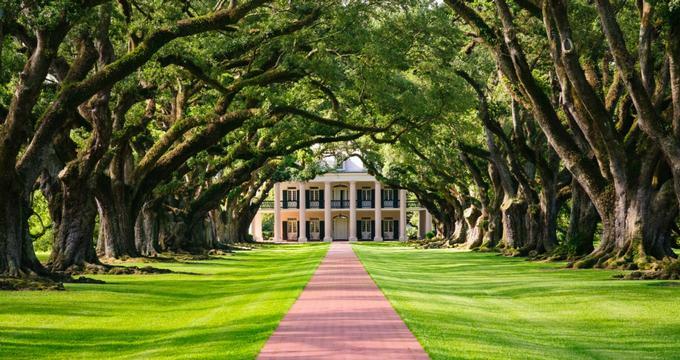 Located in Vacherie, Louisiana (in southeastern Louisiana), the Oak Alley Plantation was built in the 1830s by the Roman family. It was run as both a sugarcane plantation and, after being purchased by the Stewart family in the 1920s, a cattle ranch until the 1970s when the last remaining Stewart died it was opened to the public and turned into a museum at her request. It sits on 25 acres. The scenery - Before even entering the mansion, visitors should wander the grounds outside and view the breathtaking landscape. Make sure to see the formal garden (from the 1920s), the tall stunning oak trees and think about how much life has changed from then to now. Blacksmithery - Take a quick look back into time and learn how metal was forged on the grounds. Tent with Civil War artifacts - Visitors can learn about how the Civil War impacted Oak Alley. Exhibit on sugarcane - Visitors should make sure to view the 3D map and learn about the Romans and how they turned sugarcane into an empire, as well as how sugarcane is grown and eventually processed into its final product. This should be viewed before visitors enter the mansion as it gives significant information and details to look out for while touring the mansion. The mansion - The mansion, as well as the many outbuildings, is a sight to see! Take a tour through the beautiful plantation style home, in Greek revival architectural style. Plantation artifacts - The staff and historians at the plantation have taken great pains to curate a comprehensive and authentic collection of original artifacts specific to the history of the grounds. The majority of the collection consists of art, books and pictures from Josephine Stewart herself. One of her favorite tea sets, frequently used to serve the many guests who visited Oak Alley, is also on display. Secondary to the cultural artifacts are the plantation ground’s artifacts - bricks found during excavation, fragments of handmade pottery pieces and other small artifacts help give guests a small glimpse into what life could have been like for the people who were enslaved there. Database of slavery records and exhibit - Although difficult, the plantation maintains as complete a collection of records and research on the enslaved occupants as possible given the circumstances. This includes many records that focus on the sale of humans as property, a sad memorial of the horrors of slavery. There also is an exhibit that looks at the lives of the slaves themselves as well as discussing what their lives were like after emancipation happened. The exhibit focuses on a few specific individuals who resided on the grounds in more detail, as well. The most popular event at the plantation is the yearly Christmas bonfire. Hosted on the grounds in early December, near the levee, visitors can experience firsthand a tradition of the region - the bonfire! More than likely a result of the area’s German and French settlers, who lit bonfires to help guide Santa to their homes, the bonfire is lit, and guests enjoy a local menu made by top culinary professionals (passed appetizers like shrimp, alligator and catfish as well as fruit and cheese plates, dips and various desserts and a rotating main course that has featured duck, beef and pork in the past). Beverages are also available for sipping around the fire, both alcoholic and non-alcoholic. The meal is finished with beignets, a regional favorite! Semi-formal holiday attire is highly recommended, and tickets must be purchased in advance. As the bonfire is held outside, weather should be taken into consideration when planning what to wear. There is an onsite gift shop located not far from the main house that offers a variety of Oak Alley related products, like apparel, books, and collectibles. There are also gift certificates available for purchase that can be used at the gift shop, the onsite restaurant or for a stay at the cottages. Guests should also make sure to check out the restaurant, which features many Louisiana specialties like gumbo, etouffee, po-boys as well as an assortment of desserts and ice cream.